We deal with all types of embedded programmers. 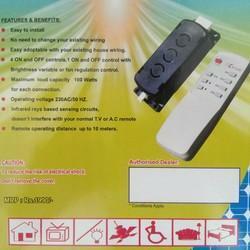 Description:Installation is simple, no external power supply and physical drives. 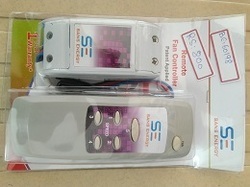 This product can easily convert common computer USB port to the serial port between the computer provides no serial port for quick passage, and the use of this product is equivalent to the traditional serial device into a USB plug and play device.SCM supports a variety of models, SCM STC download, LED screen control card, MODEM, ISDN terminal adapter to communicate with a USB port for computer or laptop.Platform:Support USB1.0 / 1.1 specification, compatible with USB2.0 specification and supports full-speed transfer mode 12MBPS, support Win98,98SE, Me, 2000, XP, Mac OS8.6, vista, win7-32 64-bit support. 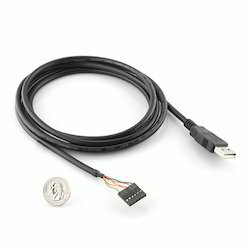 Description: The FTDI cable is a USB to Serial (TTL level) converter which allows for a simple way to connect TTL interface devices to USB. The I/O pins of this FTDI cable are configured to operate at 5V. The FTDI cable is designed around an FT232RQ, which is housed in a USB A connector. The other side of the cable is terminated with a 0.1" pitch, 6-pin connector with the following pinout: RTS, RX, TX, 5V, CTS, GND (RTS is the green cable and GND is black). This cable has the same pinout and functionality as our FTDI Basic Breakout board; you can use it to program your Arduino Pro, Pro Mini andLilypad. For use with those boards, align the black and green wires of the FTDI cable with the ‘BLK’ and ‘GRN’ labels on the PCB. There are pros and cons to the FTDI Cable vs the FTDI Basic. The FTDI Basic has great LED indicators, but requires a Mini-B cable. The FTDI Cable is well protected against the elements, but is large and cannot be embedded into a project as easily. The FTDI Basic uses DTR to cause a hardware reset where the FTDI cable uses the RTS signal. Description: This is the newest revision of our FTDI Basic. We now use a SMD 6-pin header on the bottom, which makes it smaller and more compact. Functionality has remained the same. This is a basic breakout board for the FTDI FT232RL USB to serial IC. The pinout of this board matches the FTDI cable to work with official Arduino and cloned 3.3V Arduino boards. It can also be used for general serial applications. The major difference with this board is that it brings out the DTR pin as opposed to the RTS pin of the FTDI cable. The DTR pin allows an Arduino target to auto-reset when a new Sketch is downloaded. This is a really nice feature to have and allows a sketch to be downloaded without having to hit the reset button. This board will auto reset any Arduino board that has the reset pin brought out to a 6-pin connector. The pins labeled BLK and GRN correspond to the colored wires on the FTDI cable. The black wire on the FTDI cable is GND, green is DTR. Use these BLK and GRN pins to align the FTDI basic board with your Arduino target. There are pros and cons to the FTDI Cable vs the FTDI Basic. This board has TX and RX LEDs that allow you to actually see serial traffic on the LEDs to verify if the board is working, but this board requires a Mini-B cable. The FTDI Cable is well protected against the elements, but is large and cannot be embedded into a project as easily. The FTDI Basic uses DTR to cause a hardware reset where the FTDI cable uses the RTS signal. This board was designed to decrease the cost of Arduino development and increase ease of use (the auto-reset feature rocks!). Our Arduino Pro and LilyPad boards use this type of connector. Note: We know a lot of you prefer microUSB over miniUSB. Never fear, we’ve got you covered! Check out our FT231X Breakout for your micro FTDI needs! 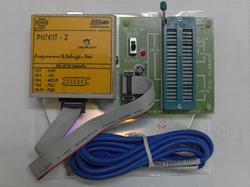 We deal with PICKIT 3 Debugger / Programmer Manufactured by Logic Power . Logic Power is the sole licensed manfacturer of Microchip tools & boards in India . PIC Kit Two programmers enable you to go through assembly code on screen while observing what the hardware does, at the same time. PIC KIT 2 runs on two operating modes – programming and debugging mode and two hardware configurations. In programming mode, only the code is programmed into the device for standalone operation. In the debugging mode, the code is programmed into program memory locations. These programmers are available at market leading prices for our valuable clients. consumption, high reliability. It Programmer supports more the 6000 Chipset. Description: This is the new PICkit 3 from Microchip. If you want an official programmer from Microchip, this is it! 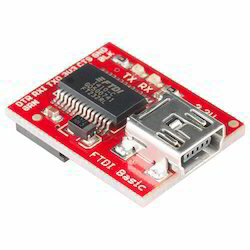 The PICkit 3 allows debugging and programming of PIC and dsPIC microcontrollers using the powerful graphical user interface of the MPLAB Integrated Development Environment (IDE). 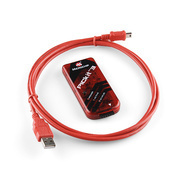 The MPLAB PICkit 3 is connected to a PC using a full speed USB interface and can be connected to the target via an Microchip debug (RJ-11) connector (compatible with MPLAB ICD 2/ 3 and MPLAB REAL ICE). The connector uses two device I/O pins and the reset line to implement in-circuit debugging and In-Circuit Serial Programming. miniUSB cable included. programmable chips, you can program MCU by choosing ICSP port.